For months I’ve been waiting to sew my Chloe dress by Victory Patterns, and now it’s finally happened. These pictures were taken at the Folk Music Festival in Richmond, VA. My husband and I joined my family in that beautiful city to celebrate my cousin’s wedding. I immediately loved all the panels, and knew it would be a great canvas for showcasing different prints. The pink floral at the front and back sides was brought from Malaysia, and I already have a pillow made from that cotton. The metallic stripes at the front sides was a vintage cotton from my Grandma’s stash that I dyed fuchsia. 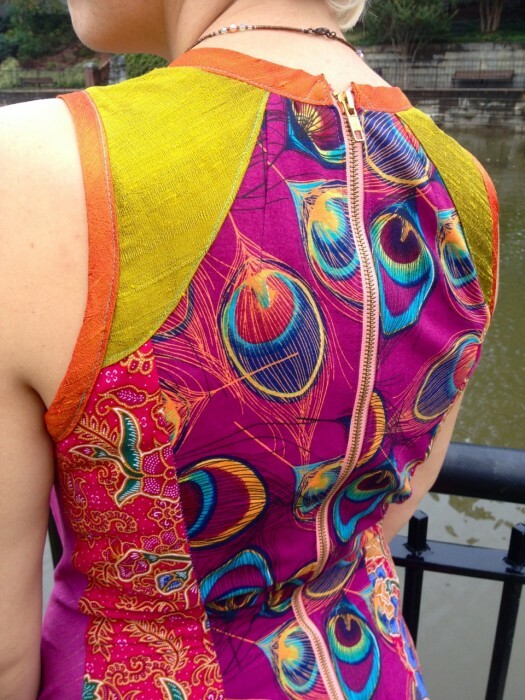 The peacock in the back was purchased for this dress at Joann (and matches some of my cloth napkins). The orange and chartreuse silk pieces are left over from my wedding dress. The pattern was very easy to construct and fit. I cut a size 10, but wound up tapering to an 8 at the top. Other alterations include: re-drafted sleeve pieces, tapered front panel at collarbone and hips, added back shoulder darts, adjusted for sloping shoulder seam, took in side seams. 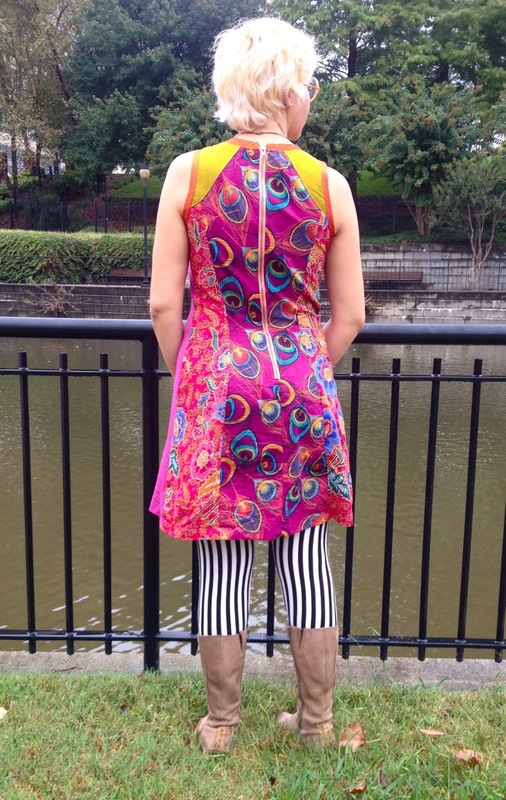 The only materials purchased for this dress was the peacock cotton (1yd @ $6) and the digital pattern. Once my muslin was adjusted, the dress was cut and sewn together in about 2-3 hours. It’s kinda the perfect dress. The Chloe pattern has simple design lines, is easy to make, and could be customized by fabric choice or pattern variations. Made in these quilting cottons, I can wear it for a bike ride at the beach, then out to dinner or some of the other fancy things I do. I can’t wait to make it again! This is kind of amazing. 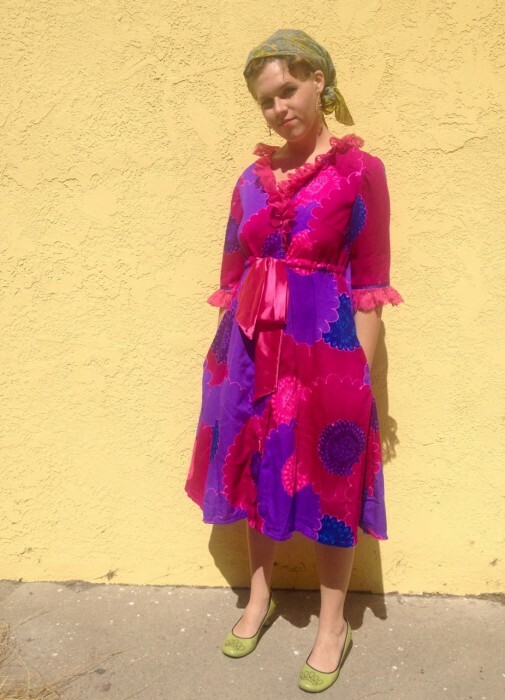 I finished this dress, wore it to a party, took pictures, and got it posted all in one day! This picture makes it look like the wind was blowing my hair to the side, but that’s just how I wear it nowadays. At the end of the party I smashed my thumb in a door, and wound up taking home an old-fashioned glass filled with ice because it hurt so much. There’s some discoloration and it’s sore, but luckily no major damage! Anyway, that’s why I’m holding my thumb in this picture. I used Simplicity 3835, which is an out-of-print Built by Wendy pattern. Luckily I was able to borrow it from a lady in my sewing group, which has inspired a pattern tracing party to be held next week (and I can’t wait!). Thank you for the pattern Jill! 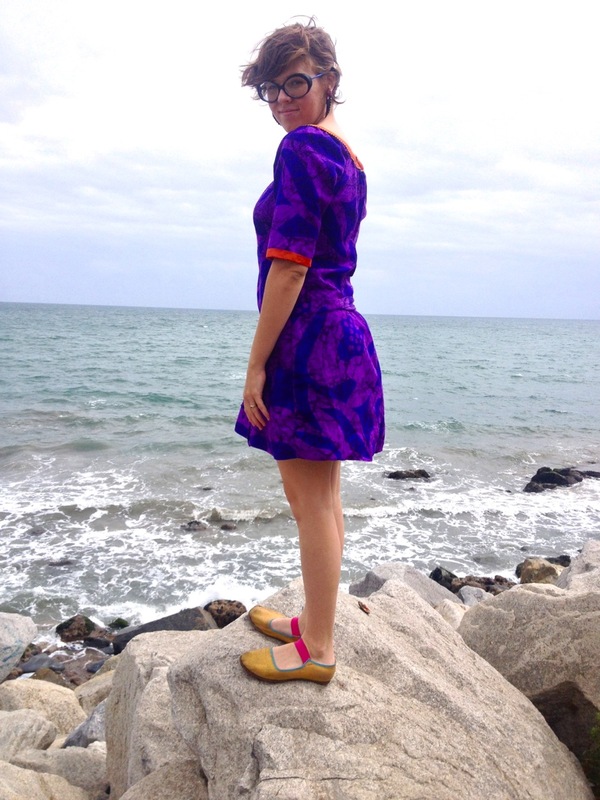 My step-sister-in-law got the purple fabric in Hawaii years ago (same as with my bathrobe). It’s a mid-weight cotton with fabulous drape. 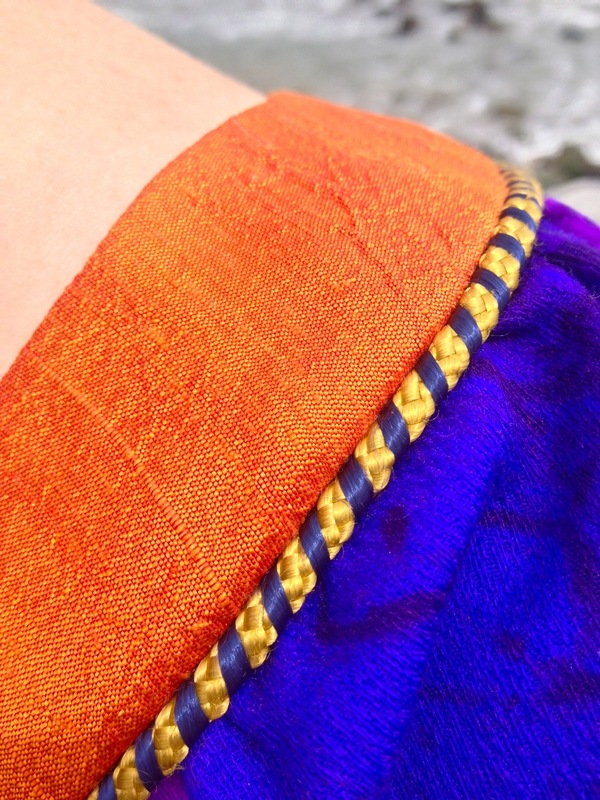 The orange collar was cut from a scrap of my wedding skirt, and the gold/blue trim was in my stash. In fact, the only new material for the dress was the $.50 zipper. 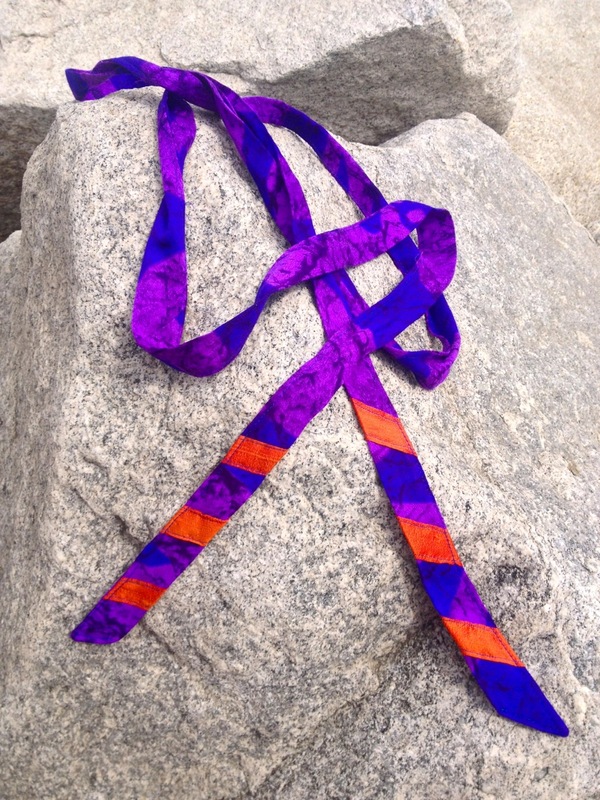 I’m really smitten by the orange/violet combination. I was inebriated when I made the original decision, and second-guessed myself a couple times while sewing. I’m so glad I trusted myself! 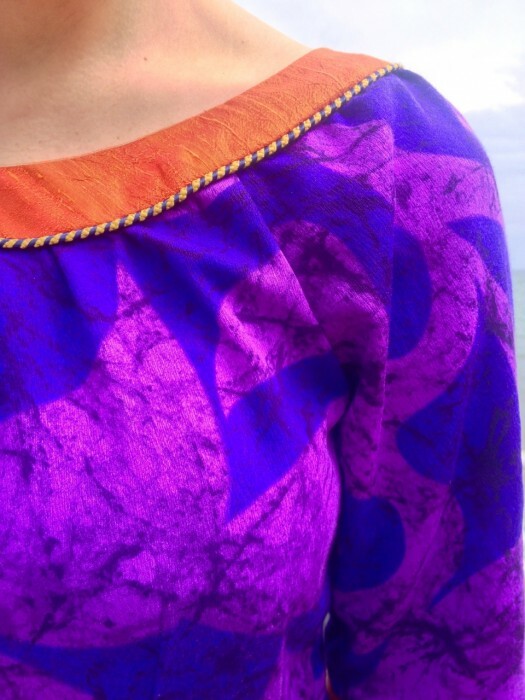 So far I’ve only worn it during the day, but the colors are so luminous in the sunlight. 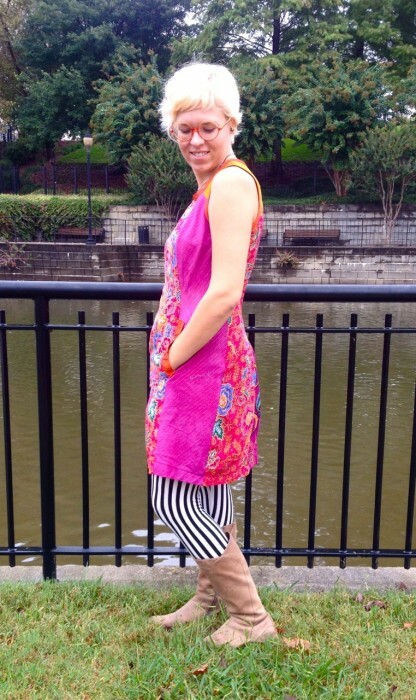 My version was originally inspired by Kristin’s chic dress, although I made many modifications to the pattern. 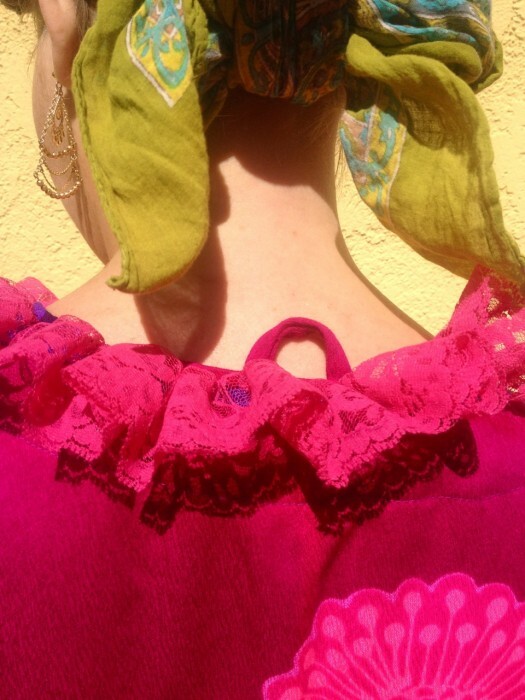 The biggest change was that I lowered the neckline by drafting a new collar (I made a muslin of the whole dress first). Since the neck was lowered, there was less excess fabric to be gathered, which I might add back in if I make this pattern again. 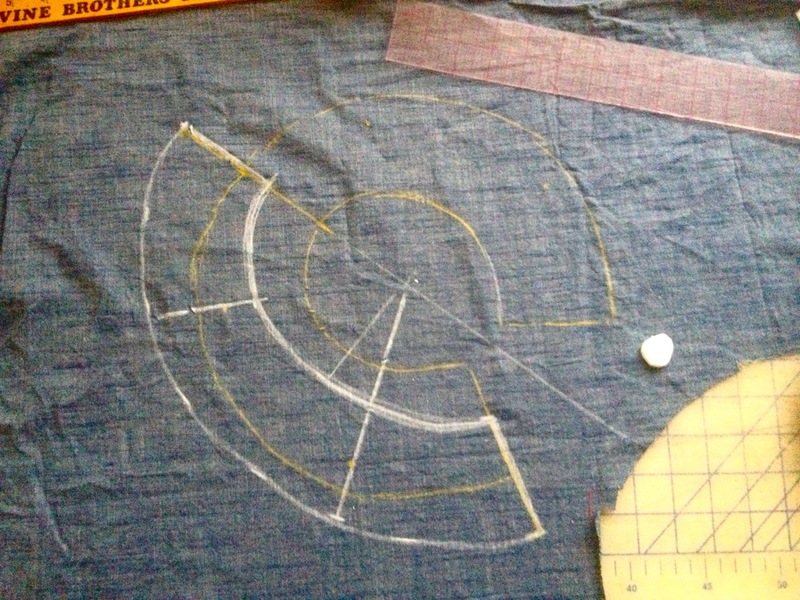 Instead of the back side darts I shaped the zipper seam, and added darts to the front. My pockets are slightly gathered at the bottom. 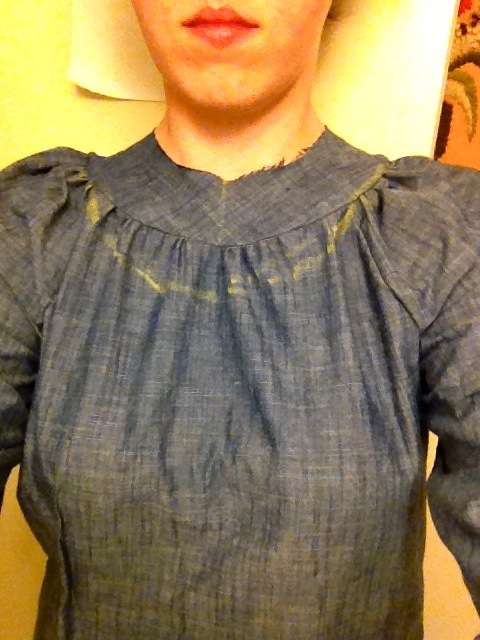 Here’s my muslin with the original neckline. The picture on the right shows the original pattern piece (in yellow) and my wider collar (in white). 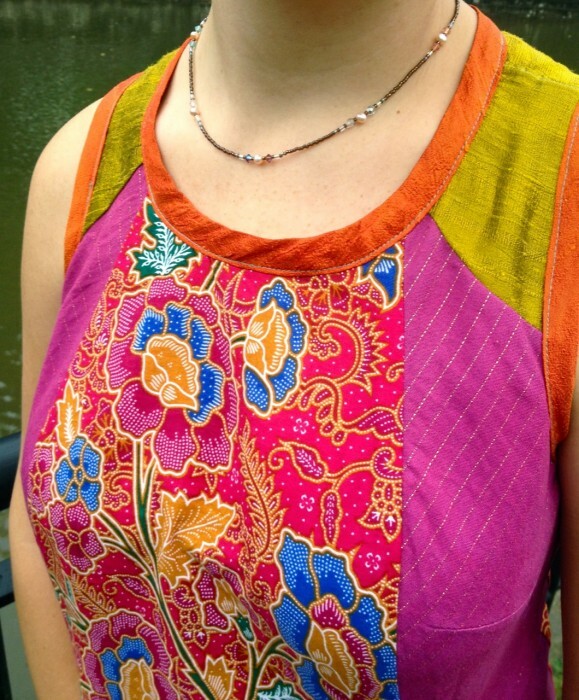 I wound up shortening the collar piece to 1.5″ finished. I cut the longer length for the dress, but wound up shortening it a few inches. This is definitely the shortest length I’m comfortable with, but I think that since I’m so covered up at the arms and chest that this dress needs to be short to keep its edge. 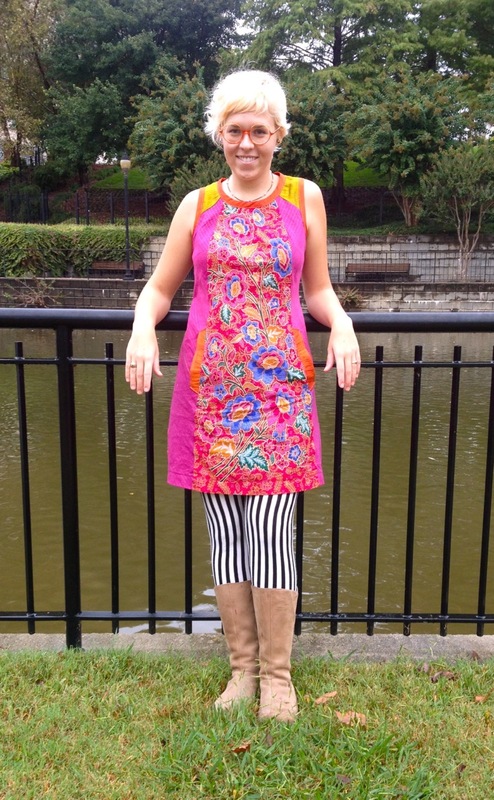 Now I’ve jumped on the shift dress bandwagon! 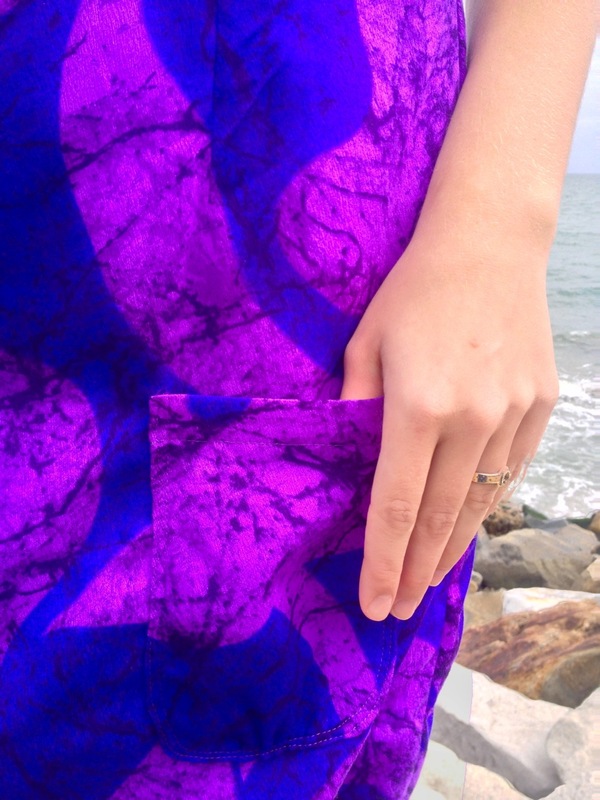 It’s not the Laurel pattern, but it’s still the sewing-world trend. I’ll definitely be playing with this silhouette more, with raglan and set-in sleeves. 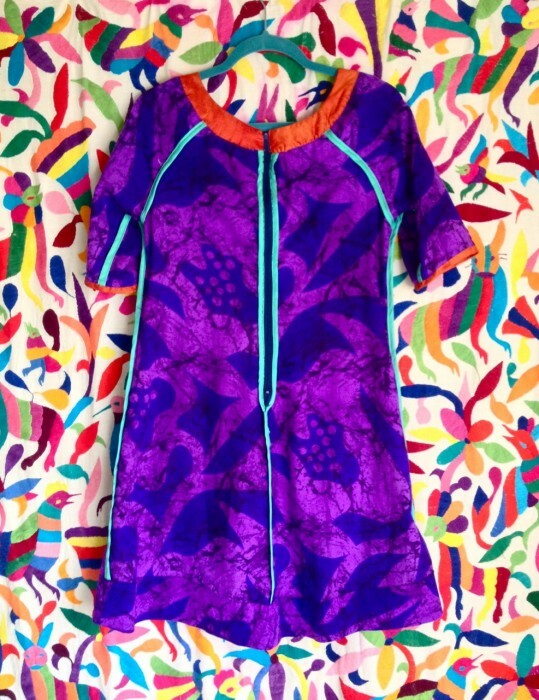 I’m calling it a miimii because, when it was on a hanger before the side seams were sewn, my husband asked “what’s up with that muumuu you’re making?” And since it’s smaller than a muumuu it must be a miimii. 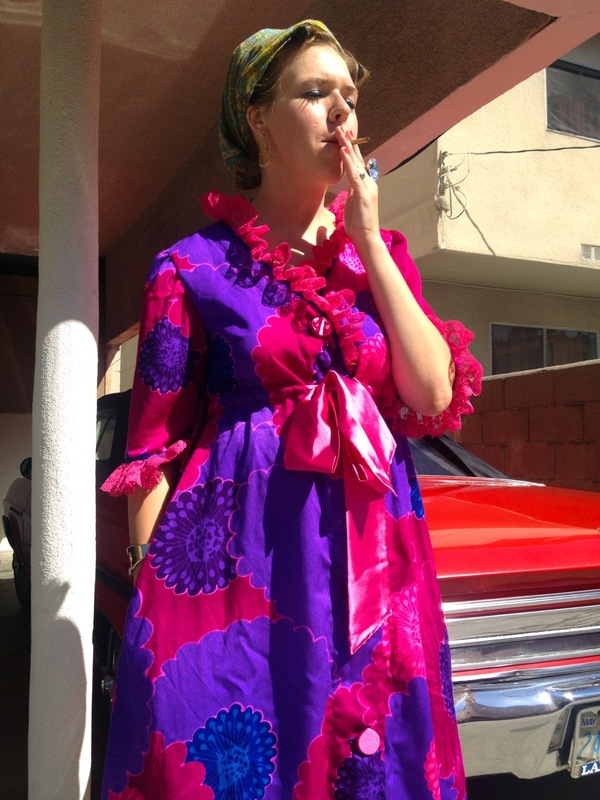 I wore it to my husband’s stepmother’s 75th birthday party in Malibu today, which just happened to be Hawaiian themed. It was extra perfect because it was her oldest daughter who had given me the fabric, and had planned the party. What’s a weekend without new lounge wear? 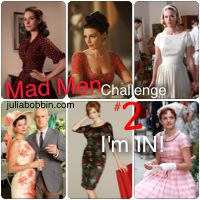 Although I’ve never participated in a challenge before, I was immediately jazzed about Julia Bobbin’s Mad Men Challenge. And although I’ve always been in love with the show’s costumes (especially after reading the ultimate Bitchy Kittens Tom and Lorenzo), the period clothing is mostly not my style. However. 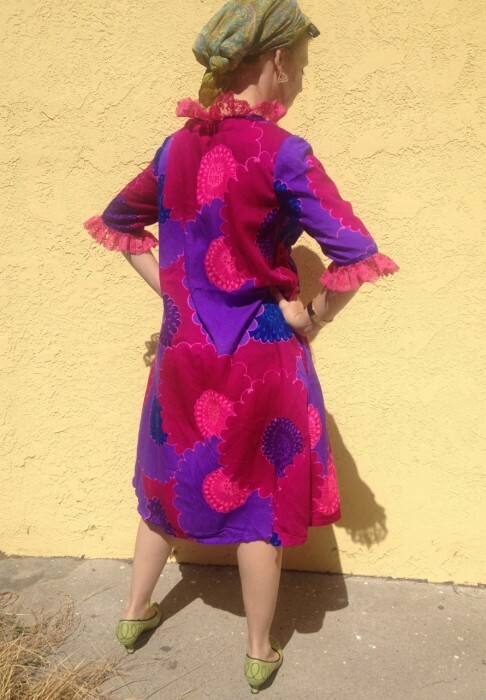 I had a amazing pattern from my Grandma, and gorgeous vintage cotton from Hawaii (a gift from my step-sister-in-law Ilaan), and damn if I’m not a sucker for over the top lounge wear. You better believe I’m designing pajamas to coordinate. Who’s coming over for brunch? This robe is begging for champagne cocktails. 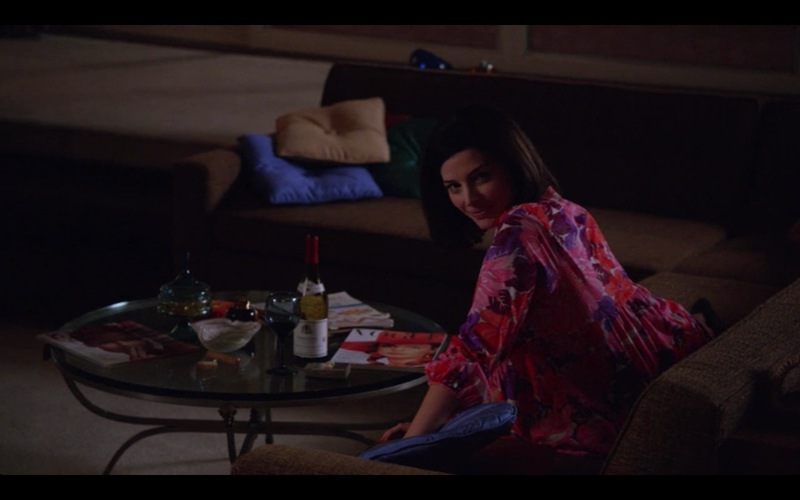 I don’t actually smoke, but I love all the scenes with Betty hanging around her house, chain smoking and drinking wine all day. Hilarity. All the ladies have such amazing wardrobes, including their bathrobes. In fact, I think every main female character has appeared on screen in a robe at this point! 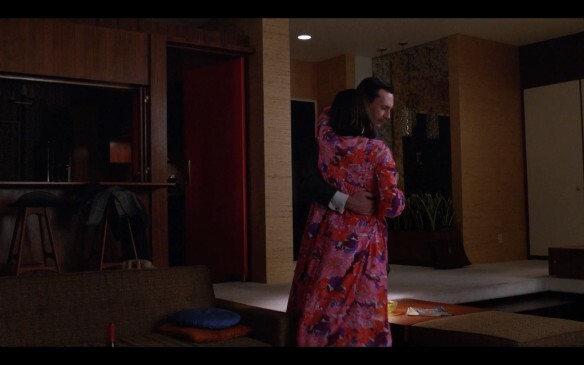 My design combines two luscious bathrobes from the finale of season 5, called The Phantom. 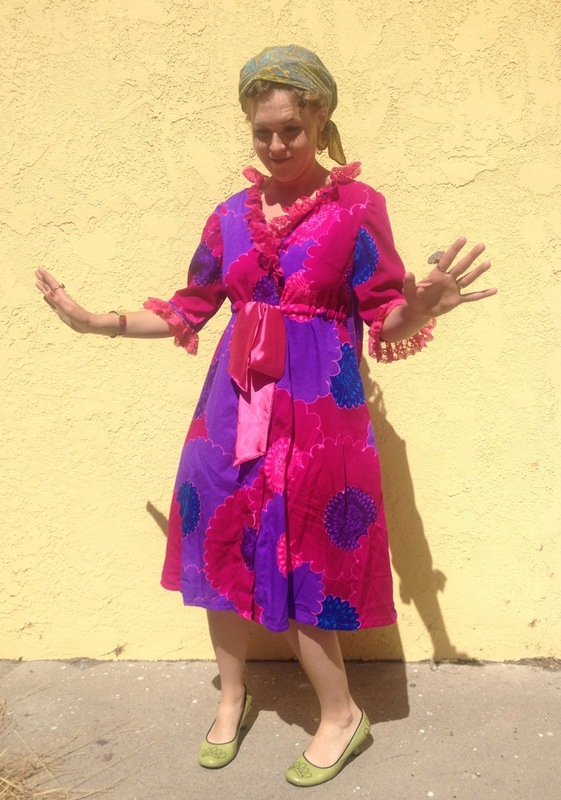 Appearing first is drunk Megan’s psychedelic robe, which has the same large flowers and neon colors as my fabric. 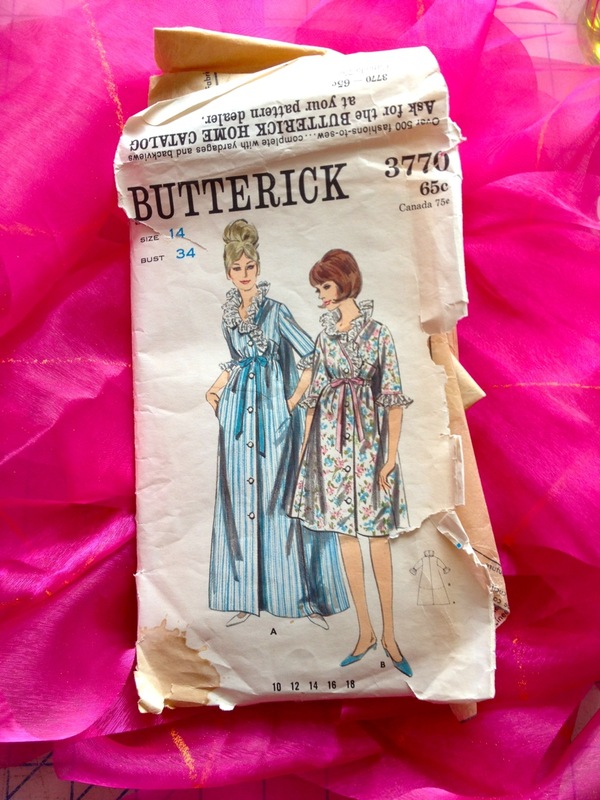 I used Butterick 3770; although I couldn’t find an exact date I know it’s from the 60s. I received this pattern after my grandma died, almost a year ago. 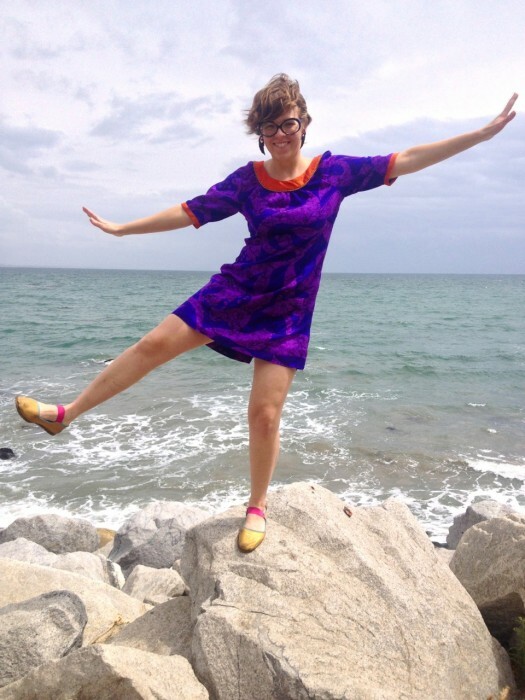 Knowing that she cut the pattern and made it for herself was a great connection, and reminded me of the wonderfully frilly dresses she would make for my birthdays. The night that I finished the construction, I dreamed that she was holding my hand throughout all my sleepy-time adventures, and it was a pretty great feeling that lasted all of the next day. I didn’t make any adjustments to the pattern (except the placement of the belt casing and using 4 buttons instead of 5). The arms are a little high, but that seems to be the style and I didn’t want to mess with it. I finished the seams with my serger, but I may come back with some bias tape. If I were to make this robe again (and had more fabric) I would make the skirt a little more flared in the back, to emphasize the cape. 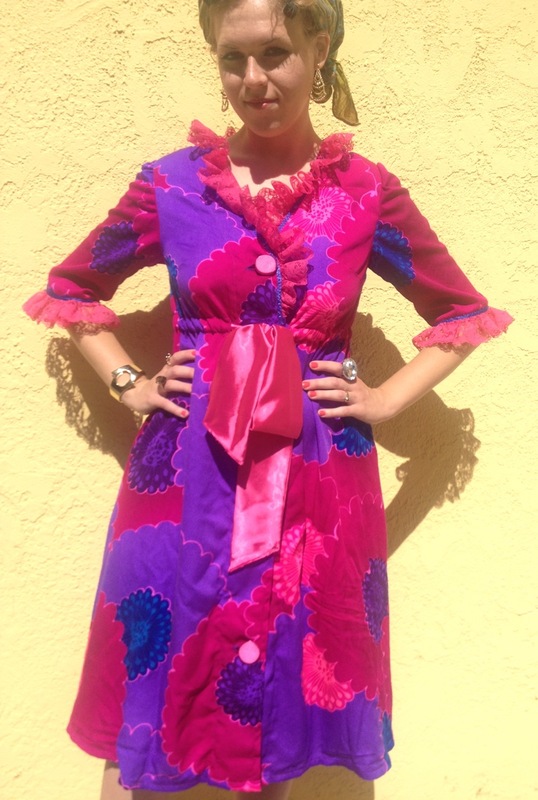 Although I certainly don’t need another robe, I want to make 5 more of these in every wild silky fabric I can find. Like so many of my projects nowadays, nearly all the materials came from my stash. 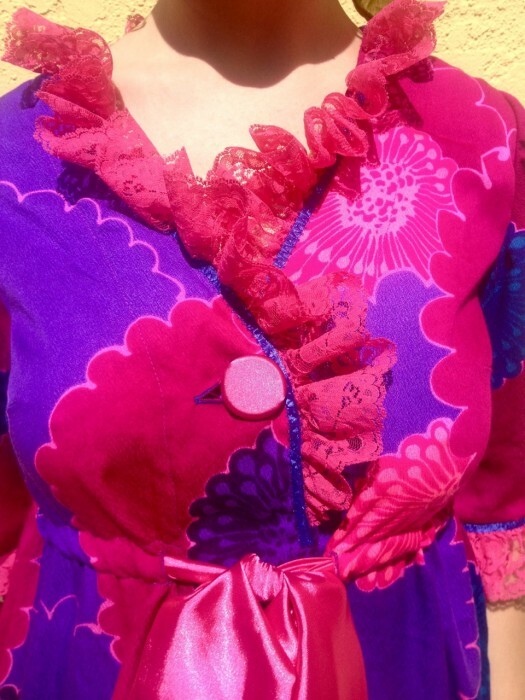 The only purchase for this robe were 1/3 yd pink satin for the tie and button coverings, 6 yd pink lace, and blue ribbon binding the ruffle, for a total of $8. I had JUST. ENOUGH. FABRIC. In fact, one of the front facings had to be cut separately, because I chose to cut the back as a single piece (I was not loving the very obvious center back seam that the pattern called for). I love that the shorter version of this robe is called “street length,” so that became the inspiration for this photo shoot. Ah, I wish I didn’t have to actually work today. I’d much rather drink strawberry margaritas, eat egg rolls, and watch movies on the couch all day. But I might wear this to a potluck tonight.